This README covers Johann's version of KodakPCD, 010808. KodakPCD is a utility for creating Kodak Portfolio Photo CD discs that will play only in a Kodak Photo CD player. Discs created with this software will not work properly in either a PC, or a CD-i player. Hopefully future versions will address those issues. You can use Graphics Workshop Pro to create PCD files from existing images in other formats (i.e. JPEG), or you can gather PCD files from existing PhotoCDs. Place all the files in a directory on your hard drive and give them names like img0001.pcd and img0002.pcd. This will make it easier to sequence the images on the CD with KodakPCD. ImageMagick is another application that can convert JPEGs to PCD. It is quite a bit more difficult to use, however. Hinzufügen - "Add" adds PCD files to the file list. Startup wählen - "Startup Selection" I think this lets you select a different set of base files to be modified for making the Photo CD tracks(?). Leave as is unless you really know what you are doing. Tracks erzeugen - "Make Tracks" makes the cuesheet and trk files needed by your CD cutting software. CD-Größe - "CD Size" shows the size of the Kodak Portfolio Photo CD to be created. Beenden - "Close Program" says goodbye. Start by pressing Hinzufügen to add files to the file list. You can multi-select in the add files dialog by selecting one file, then shift-selecting the end of a range. Ctrl-selecting should work as well. Note that the easiest way to select all files, and keep them in order is to select the last file in the add files dialog, then Shift-select the first file. All the files will be selected in proper order (this is a Microshaft "bug" that has been around forever). Once all your PCD files look good in the file list, click on "Tracks erzeugen" and the cuesheet and track files will be created in the same directory as your PCD files. This may take some time, so be prepared to wait a bit. 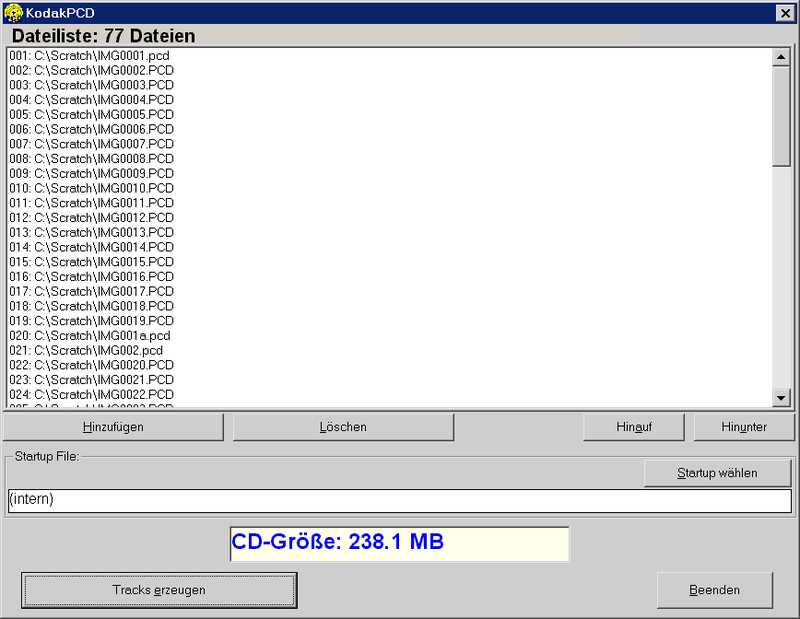 Several CD-cutting apps will allow you to open the ".cue" cuesheet created by KodakPCD and cut a CD from it. CDRWin is one of them. Refer to your CD-cutting software documentation for more information about cutting a CD from a CD image or cuesheet.